After a peaceful week staying at our dear friends’ home in Les Crosets, Switerzerland, we arrived in Chamonix during the hustle and bustle of a Friday night. The apartment we rented, while in an ideal location, was situated on a major thoroughfare and very noisy until the wee hours of the night. There was a youth hostel right down the road and so we would hear parades of young people returning from partying between 1 and 4 in the morning. Our temporary backyard in Les Crosets, Switzerland. This year, the marathon is part of Salomon’s Golden TrailSeries, so there was a lot of media hype around the race. My original goal coming off last year was a top-10 finish, but after seeing all the incredible athletes who were signed up, we knew that was going to be nearly impossible. The main goal was to try to prevent what went wrong last year from happening again this year. The temperatures were very mild for our entire trip to Europe - upper 60’s to low 70’s - until the day of the race, where temperatures soared to around 86. I knew that running in the heat was going to be a challenge for me because I never run in those temperatures in the PNW, let alone at altitude, which seems to make the sun hotter and more draining. More cheese and bread, please! Chamonix is the accessibility to a variety of foods and cuisines at an affordable price. We ate everything from curries to sushi, only cooking a couple of nights, which was a nice vacation from doing the dishes. 2. Last year we did a big 20 miler two weeks out from the race (and soon after arriving from the tiring, jet lag trip over); we cut it to 14 miles this year. 3. All I had with me during the race last year was GU and it was not going down well. I think it was because I was too dehydrated. In my pack this year, I had variety: GU, single-serve Trail Butter, shot blocks and Skratch labs in one of my bottles. 4. I did a true taper – not just a week before. My mileage was significantly lower 2 weeks before the race. 5. After seeing that the weather was going to be very warm, I went out and bought a white hat and an extra handheld to use during the part of the race where I ran out last year. Checking out the course two weeks before the race. 6. I took off my necklace before I raced this year, because last year it got wrapped around the top of my water bottle preventing me from using it properly. It was already warm outside at 6:15 in the morning when I stepped out to do a short warm up. As soon as I opened our door, I see fellow American Pat Smyth warming up. When I approached the start line, I scanned to find a familiar face amongst the jumble of languages being spoken and the loud music blasting over the speakers. I soon found Magda Boulet, Alex Varner and Sage Canaday. I love seeing my USA teammates. I don’t know what they feel, but I feel such a bond with them even though I am only friends with some via social media. There is something about being so far from home that brings us together in solidarity. After the announcer made us all do the wave, the backwards countdown from 10 in French began and, with the sound of Hell’s Bells, we were off. I mentioned that I wanted to start out slower this year and what felt like slower ended up being 15-20 seconds a mile faster for the first 4 miles. I was in 15th early during this section and Anne Marie Madden passed me after a very controlled start as she worked her way up into the top 10. Making my way to the top of Possette. Tad spent all week mapping out his spectating spots so I knew I would see him at several places to get insight on where I stood among the field and receive reassurance and encouragement. 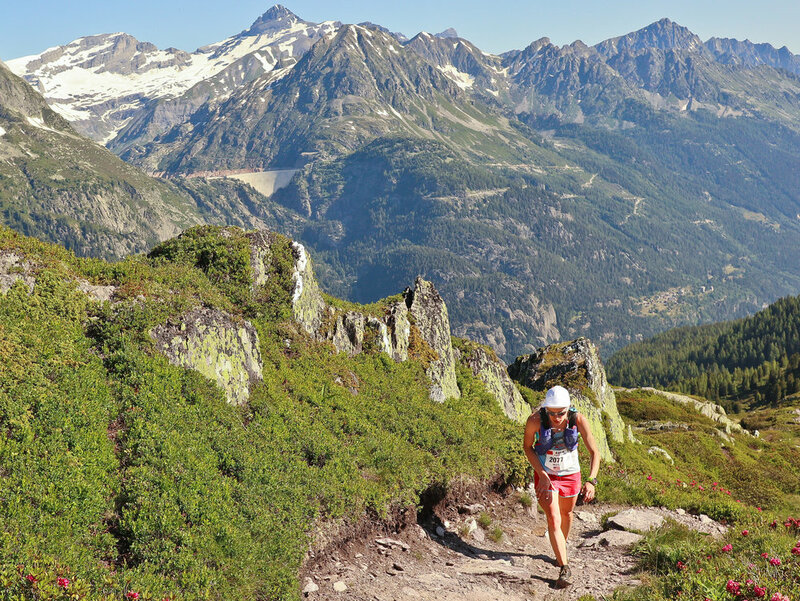 Magda came into sight and I finally caught up to her at the Vallorcine aid station (mile 11ish). I started the climb up to Possette with her. As I started to pull away I focused on Emma Clayton of Great Britian who was in front of me, but because I stopped at the water station, she got away from me on the ridge. Going over the ridge I was in 12th place and thinking maybe a top ten was possible as surely some of the leaders would fade on the toughest part of the race yet to come. (As it turns out, I was wrong, these are some tough women!) There had been a significant amount of snow on Col des Possette two week prior, and come race day, all of it had melted; I couldn’t believe it. 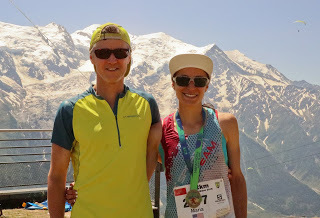 The Marathon du Mont Blanc is a very special race. Not just because of the stunning scenery or the competition, but also because the spectators and volunteers are kind, encouraging and passionate. Our first names and country flags were on the race bibs, so I had a thousand fans on course screaming, "'allez, allez, Maria!" A moment that sticks out to me is when I was up on Aiguillette de Possette and Tad was running behind me with the camera, I started to doubt myself and asked him - thinking no one was around – to tell me I could do this. As soon as I popped up over a rock, a man and women were perched above, and the man said in a heavy French accent, "of course you can do this, Maria!" The cool thing is Tad got it on camera. To hear the encounter and see some snippets of the race, part one and two are on my IGTVchannel (@mariadalzot). Coming off the ridge and dropping 2500 ft down the technical descent into Le Tour, I was passed by a young woman from Nepal who flew over this technical section and then by ultrarunner Jo Meek of Great Britain. With the drop in elevation, I soon got uncomfortably hot. I started running off trail to fountains in people’s backyards to cool off. I know this caused me a lot of time, but I just held the memory of last year’s breakdown in my head, so I stopped at every water stop because I was so afraid of running out of water or getting dehydrated. One thing I need to work on is my aid station protocol. I would make the Western States crews cringe. Tad came into the aid station tent at Le Tour while I was trying to fill up my water bottles but got yelled at and told to leave. So, I had to fill up my bottles on my own and then go out of the tent where he was able to give me my extra bottle and pour water on my head. I felt really refreshed afterwards and approached the part of the course where I lost my marbles last year, the overpass. Once crossing the road, we start a 1,000-foot technical climb immediately followed by a 1,000-foot technical descent. There were photographer and videographers all over this section which helped me keep my power hiking honest. Once I made it to the Flegere aid station, only 5km separated me from the finish, but this is a very exposed and rocky section with a steady incline all the way to the finish. It is hard to describe just how hard this section is, but suffice it to say that if Megan Kimmel describes it as tough, that’s saying something. It really seemed to take forever. My watch was running long, and I was already at 26.5, but not yet at the finish. After crossing three snow fields, finally the finish shoot came into view! I mustered the energy to get a couple of high-fives coming in and then crossed the line so relieved to be done. They immediately checked our packs to make sure we had the required gear before letting us exit the finish area. We got dressed up for our last night in magical Chamonix. I met Tad, but he wasn’t sure where exactly I finished. He thought I had faded considerably and counted me in 20th place, but he didn’t know that some women on the course were part of the Duo race that started the previous night. On the way back to the house, I looked up results to see that I was 15th woman. Yes! We were stoked. Anne Marie finished ahead of me in 12th and Magda behind me in 16th (closing 5 minutes or so on me the last 5k!). Full results here. I felt incredibly nauseas the rest of the day and it continued the following morning. My appetite finally came back, just in time for our final meal in Chamonix before heading back to Paris en route home. I don’t know yet if I will return to Mont Blanc for the marathon next year. Third time is the charm, right? We know so much about the course now and learn so much each time, it’s hard to not give it another try. But, damn, is it hard! 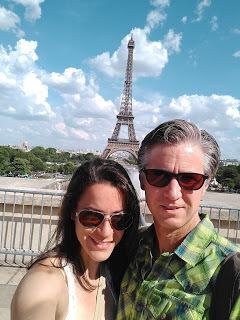 We drove to Paris two days after the race to be tourists for 24 hours. 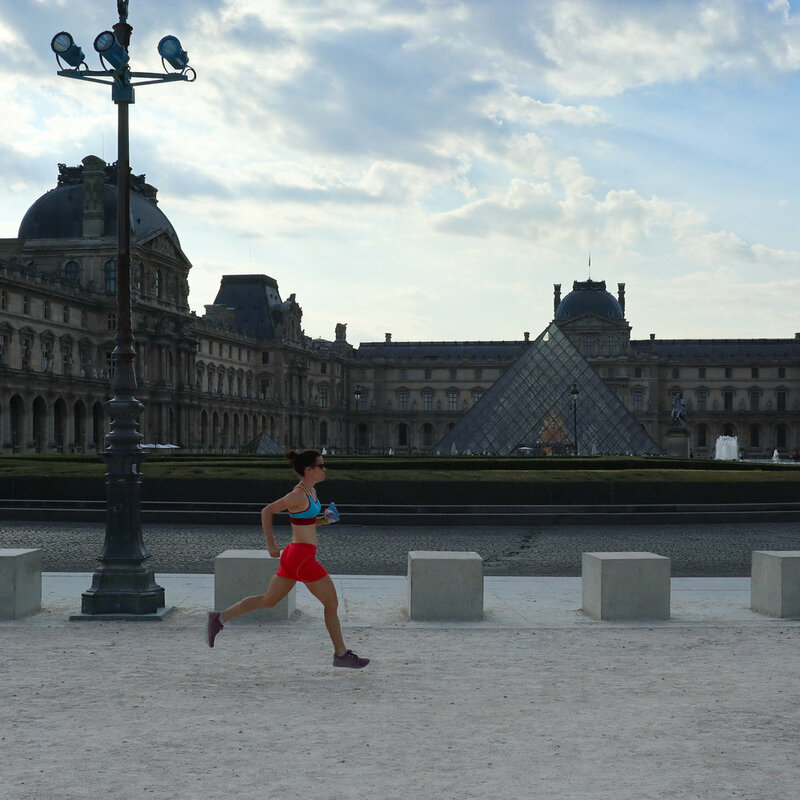 In an 8-mile run, we saw Jardins du Tracadero, Eiffel Tower, Arc de Triomphe, Champs-Elysees, Jardins des Champs-Elysees, Place de Concorde, Lourve, Cathedrale Notre-Dame, Musee d'Orsay, Seine, Esplanade des Invalides, and Palais Bourbon. Basically, a whiplash of all of Paris in 90 minutes. The same day, we drove to Versailles and toured the palace and gardens which was extremely cool. Crowded and hot, but cool. According to the museum site, Versailles is one of the greatest achievements in French 17th century art. Since the French Revolution forced Louis XVI to leave Versailles for Paris in 1789, it would never again be a royal residence. Instead, it became the Museum of the History of France in 1837. The rooms of the Palace were then devoted to housing new collections of paintings and sculptures representing great figures and important events that had marked the History of France. Trying not to get hit by traffic at the Arc de Triomphe. Unsurprisingly, I felt run-down and woke up the next morning with a sore throat and head cold which made traveling home even more uncomfortable. But I can’t complain too much because this is my first cold in two years and what do you expect after a hard effort and surrounded by crowds of people. Thank you for La Sportiva, PRiME Bellingham,Align Chiropractic, Terrain Gyn, Trail Butter, Ona Treats, Lily Trotter’s Compression, and Native Eyewear for all your support, expertise, nutrition, recovery, and injury prevention leading up to the race. I am beyond grateful for having a running career that has had such longevity and such incredible support along the way. Thank you to everyone who sent me a message of encouragement before the race and a congratulations after the race – your love was truly felt. Thank you to Colleen and Erwin Martens for graciously giving us their home to live in for a week prior to going to Chamonix. We are overwhelmed with your hospitality! Thank you to iRunFar for the shout out in This Week in Running. To see more of Tad’s pictures and video footage, you can check out my Instagram feed and IG TV @mariadalzot. A lap around the Lourve.